There are several types of amplifiers used in car audio systems that are unique to different purposes and types of installations. It is important to install the proper amplifier to ensure the speakers sound the best, warranties are not voided, and equipment doesn’t get damaged. The following sections outline the various types of amplifiers primarily used for car audio installations. Each car audio amplifier has a class that defines the topology, or how the amplifier’s circuits are designed to amplify a passing current. The amp class can define the size of the amp, the efficiency, and the overall sound quality of the amplifier’s output. Class A/B Amps – This is the most traditional class for amplifier. These amps are moderately efficient, usually have a larger chassis, and traditionally have the best sound quality. Class D Amps – This is a newer amplifier design that is becoming very popular due to the smaller chassis, high efficiency, and relatively good sound quality. The most common way to separate types of car amplifiers is by channel, or how many different sets of speakers the amplifier can power. For example, a 1 channel amplifier is great for powering 1 speaker and a 4 channel amplifier is best for powering 4 speakers. It is most common for the single channel amplifiers to power a subwoofer and the multi-channel amplifiers power the speakers. 1-Channel Amps – These are most common for subwoofer installations and often are designed for processing low frequencies. These amps are also referred to as monoblock or single channel. 2-Channel Amps – Most commonly used to power 2 full range speakers in the front stage or the rear fill. Occasionally it is more cost effective to bridge the two channels together and turn the two channel amp into a single channel for subwoofers. 3-Channel Amps – These amps are not as common, but are highly sought after for installations that are comprised of a subwoofer and two full range speakers. Three channel amps typically have a single channel dedicated to a subwoofer (with low frequency filters) and the other two channels dedicated to a front right/left speaker pair. 4-Channel Amps – Most commonly used to power the front right/left and rear right/left speakers. 5-Channel Amps – The all-in-one amplifier that has four channels designed for the front and rear speakers and the fifth channel reserved for the subwoofer. 6-Channel Amps – An amp used more frequently in the marine environment when the installation requires powering speakers in the boat and on a wake tower. Another way that amplifiers can be organized is by the unique features and technology. Amplifier manufacturers are always trying to find new innovative ways to make installation easier, set-up/tuning faster and simpler, and be the first to launch new amplifier tech. While the basic function of the amp stays the same (that is, to amplify an audio signal), these convenience features could make or break an amp. Micro Amplifiers – These amplifiers are uniquely designed to fit in small areas, such as near the spare tire, in a glove boxes, behind the dash, or inside a motorcycle fairing. 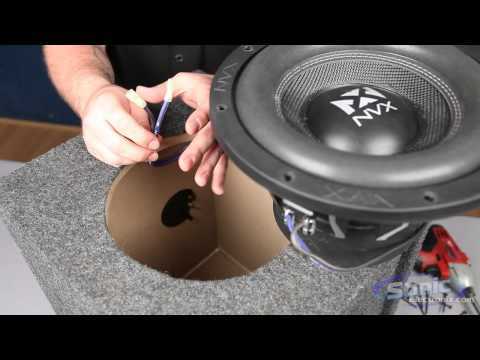 Due to the power inputs and physical size constraints, these amps typically don’t put out insane amounts of power, but most of them will fit the needs of the average car audio installation. Bluetooth Amplifiers – Bluetooth amplifiers allow users to send an audio signal from a source unit to the amplifier without running additional cables. In a traditional car audio set up, this means that a set of RCA cables would not need to be run from the headunit to the amplifier and would instead simply connect via Bluetooth. The more common application is to forget the headunit completely and just steam directly from a smartphone or tablet. For custom iPad in-dash installations, Bluetooth amplifiers are perfect because installation is simple and the installer doesn’t need to use a bunch of additional adapters. These amps are also great for ATVs, UTVs, and other vehicles where a smartphone is more convenient to use.